MMZ Masters display their spoils after taking game one of the seven-match series against the GT Umpires. 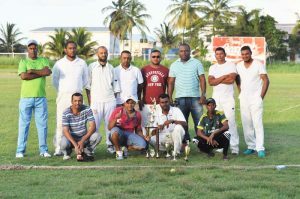 Played in sweltering heat, a 95-run partnership between man-of-the-match Zaheer Haniff (31) and Jitendra Kishore (30) led MMZ Masters to an imposing 185-8 from 20 overs. The pugnacious Troy Khan (26) and Munishwar Balgobin (27) give their team a solid foundation with a quick-fire 46-run stand in 4.3 overs before the West Coast Demerara side lost seven wickets for 45 runs in their last five overs. Shannon Crawford (2-17) and Randy Latiff (2-20) bowled well for the Umpires who were bowled out for 115 in 20 overs as Skipper and opening batsman Rayn Banwarie top-scored with 25. 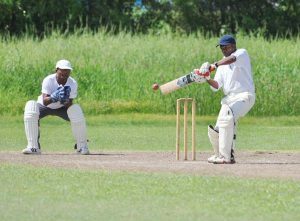 But only division one all-rounder Shaun Massiah (20) and Mario Nichols, Anwar Buksh and Mohan Chatram, with 10 each, of the other batsmen, got into double figures. Shawn McKay and Vinood Rajkumar took two wickets each to see their team to a 1-nil lead in the seven-match series. which cost 20, with another boundary. Balgobin then smashed Stuart, who took 20 wickets in six Tests for the West Indies between 2000 and 2001, for two fours, before Khan was stumped by 1978 National U-19 Keeper Mario Nichols as left-arm spinner Trevor Velaidoum made the breakthrough. Khan’s 26 was decorated with three fours and two sixes. Balgobin smashed five brutal boundaries in a cameo 30 before he was removed by Lattif, who also had Shan Persaud (2) two runs later as MMZ slipped to 67-3. Kishore and Haniff joined forces on the flat track and played several audacious shots before Haniff retired out at 161, while Kishore retired a run later. Crawford had Flemray Lambert (2) and Arshad Ali (0) neatly stumped by Nichols before Stuart bowled Arlie Rutherford (0) behind his back with a slower ball. Chatram clobbered Stuart for six off the last ball of the innings before the Umpires began their run chase in disastrous fashion when Kowlessar bowled Kelvin Austin for a first ball duck. Banwarie overcame a shaky start to reach the ropes twice in his top-score and offered token resistance. With International Umpire Nigel Dugid and ex International Eddy Nichols among a fair sized gathering, Banwarie and Nichols offered hope before Banwarie was stumped off Haniff and Nichols (10) missed a sweep and was LBW. Massiah (20) was just beginning to look set for a big score when he was LBW as wickets tumbled in quick succession. A minute of silence was observed for the passing of Coach, scorer and Umpire Daniel Richmond who died following a motor accident in Georgetown last month.